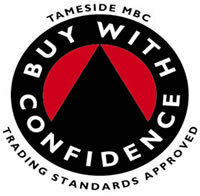 We are now an approved member of the Tameside Trading Standards buy with Confidence Scheme. This scheme was introduced by Tameside MBC to establish high standards of trading by businesses. The scheme is intended to demonstrate a commitment by the business to fair and honest trade and a commitment by Trading Standards to support business. - Tame Valley Steelstock Ltd is committed to providing a quality service to its customers. - We agree to comply with the spirit and the letter of both the civil and criminal law relating to business. - We will ensure that all our staff are competent for the work they carry out, in relation to relevant civil and criminal law, and that they are fully aware of the commitments made by the business relating to the scheme. - Our emphasis is to supply prime quality material and provide an excellent customer service. In the unlikely event that a customer is required to make a complaint we have a complaints procedure in place, which should provide an expedient resolution to their query.